The principle of stereoscopic vision is simple. Each eye sees a slightly different aspect of any view. The right eye sees slightly more of the right side of solid objects in the foreground, and the left eye sees slightly more of the left side. In addition, when the eyes are gazing at an object in the foreground, the objects seen by the right eye in the background are displaced to the right, and the objects seen by the left eye in the background are displaced to the left. These two slightly different images that fall on the retinas of the right and left eye are transmitted to the brain and are fused into a scene which enables us to perceive depth. The principle of stereoscopic movies taken and shown by the methods described in this article is quite simple. The images which are normally seen by the right and left eye of any scene are recorded photographically by means of a movie camera and an attachment, as two images, side by side, on a single frame of film. The film is processed in the normal manner and then projected on the screen and is viewed in such a manner so that the right image is seen only by the right eye, and the left image only by the left eye. The two images are then fused into a three-dimensional image. The amount of detail visible is far greater than that seen with ordinary movies. The construction of an attachment for an 8mm movie camera is shown in the drawings. The attachment consists of two front surface aluminized mirrors and two right angle prisms mounted as shown. This at- ‘ tachment causes two images of any scene to fall upon the movie film. A record of the scene as seen through the right aperture falls on the left side of the film and the scene as seen through the left aperture falls on the right side of the film. Stereo pairs are thus recorded in rapid succession on the movie film. The mirrors and prisms are mounted on a stiff piece of wood or plastic and this unit is, in turn, mounted on a box made to receive the camera. The unit is mounted so that the prisms are centered in front of the camera lens with the line of separation between the two prisms being perfectly vertical and in the exact center of the camera lens. The unit shown was constructed for a Cine-Kodak Eight, Model 25 camera. Front surface mirrors and prisms can be purchased from the Edmund Scientific Corp., 101 East Glouster Pike, Barring-ton, New Jersey. To adjust the mounting before taking pictures, a simple double convex lens is placed in front of the prisms and is carefully located in the optical axis of the viewing device in essentially the same position as the camera lens. A ground glass screen is placed behind the lens to serve as a focusing screen. The focal length of this testing lens is not too important, but should approximate the focal length of the movie camera lens. We are now ready to adjust the stereo attachment. Take the device into a dimly lit room and aim it directly at an object about 15 ft. away which is brilliantly illuminated. This can best be accomplished by placing the camera temporarily in the device and sighting through the view-finder until the test object is accurately centered. Remove the camera and install the test lens and [Continued on page 155] ground glass. Turn the 45Â° mirrors until the test object is centered in the strip on each side of the centerline on the ground glass screen. The object should be at the same level on each side. If one image is higher, it will be necessary to tilt the mirror on the opposite side slightly until the images are on the same level. If the image falls above or below the horizontal center line, it will be necessary to tilt the stereo unit on the camera holding box until the test object image falls on the horizontal line. The next operation to carry out is the location of the right and left edges of the masking device. Block out the image from the left-hand side of the stereo attachment by covering the left mirror. Locate a strip of cardboard in the plane of the masking device. The image will be seen to be on the left side of the ground glass and when the cardboard strip is moved to the right, the right edge of the left image, i.e., the center edge, will be seen to move to the left. When the cardboard edge is moved to the left, the center edge of the left image on the ground glass will move to the right. By trial and error, move this edge back and forth until a position is found in which the right edge of the left image on the ground glass is exactly on the centerline. When this has been accomplished, mark the location of this edge, and then proceed in a like manner, to locate the left border of the masking device for the left side of the stereo attachment. When the location of the two edges has been determined, cut a piece of cardboard exactly the right length and mount it as illustrated so that the edges are in the positions previously determined. This device prevents the right picture from creeping over into the left half of the frame and vice versa. When these adjustments have been completed, the unit is ready to take stereo pictures. Load film into the camera in the regular manner. Since the angle of view has been cut in half by virtue of the fact that we are putting two pictures side by side on one frame of the film, it is necessary to cut out one-quarter of each side of the camera view finder with black masking tape. Since there is some light loss in reflections, and since only half of the camera lens takes part in the formation of each picture, it is necessary to open the diaphragm two stops. That is, if you normally shoot Kodachrome in bright sun light at f-8, open up to f-5.6 with the stereo attachment. When the developed film is returned, it will have a stereo pair in each frame of film. If the film is projected in the regular manner, a stereo pair will be seen on the screen, with the right hand member of the pair on the right. And now for viewing. The problem is to present the right image to the right eye without the right eye being able to see the left image and vice versa. To polarize the light, secure a moderately large piece of flat polaroid sheet. Such a piece of polaroid can be obtained in the form of an automobile sun visor. These visors have been on sale recently for about one dollar. If you are unable to secure a polaroid sun visor, polaroid disks can be purchased from the Edmund Scientific Corp.
Construct a frame and mount two pieces of polaroid material in each half of the rectangle with the polarization axis of the right piece horizontal and the left piece vertical. If this frame is placed about six inches in front of the movie projector and carefully located, it will polarize the right image horizontally and the left image vertically. If the polarized images are then each allowed to fall on a flat front surface aluminized mirror, the images can be directed to the screen and accurately superimposed, one on top of the other. You’ll need a screen which will not depolarize the lightâ€”an ordinary glass beaded screen won’t do. You can make such a screen by painting a flat surface with aluminum paint, or by grinding a sheet of window glass with No. 400 carborundum. Carborundum for this purpose can be secured from the Precision Optical Co., 1001 East 163rd Street, New York 59, N. Y. If the ground glass screen is used, the images are viewed from the back of the screen and each spectator wears eyeglasses containing polaroid disks. These glasses can be made by replacing the lenses in sunglasses with disks of polaroid material cut from the auto sun visor previously mentioned. The right polaroid disk is turned so that the polarization axis is horizontal and the left disk is turned so that the polarization axis is vertical. Thus the right image is able to enter only the right eye and the left image enter the left eye. The result is a brilliant, full-colored, three-dimensional motion picture. It should be noted that the reflection from the front surface mirrors in projection reverses the images, but when the scene is viewed on the back of the screen, the image is reversed again to its normal relationship. The use of the polaroid material cuts down on the light reaching the screen, but when a ground glass screen is used and viewed from the rear, you get a very brilliant image. Looks like the family is about to watch a nuclear test blast. 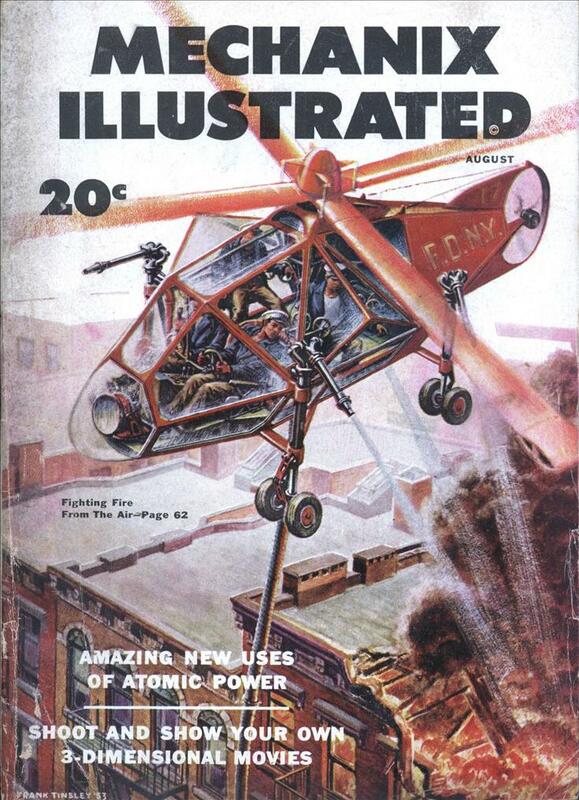 Charlie, from the cover, ‘Amazing New Uses for Atomic Energy’. Have you posted that one? And the Future of Television! shutter goggles like IMAX uses. nVidia, the video card people, have a 3D kit which includes a video card, shutter glasses and software for several games. Charlie… years ago you had an article about a TV for people who watch different programs. It would have been perfect for 3DTV. I saw “Coroline” on a large screen in 3d recently, and saw Harry Potter in IMAX 3-d (only part of the film used the technique in that case.) “Monsters and Aliens” and several othes are to use the same method (as did “Bolt” I think) and it’s basically flawless, and using a single projector. I can’t wait for the re-releases of the “Toy Story” series later this year. This would work with the DIY LCD projector described at Lumenlab. The only modification you would need would be to make sure you removed the polarizer sheet(s?) from the LCD monitor that you used. 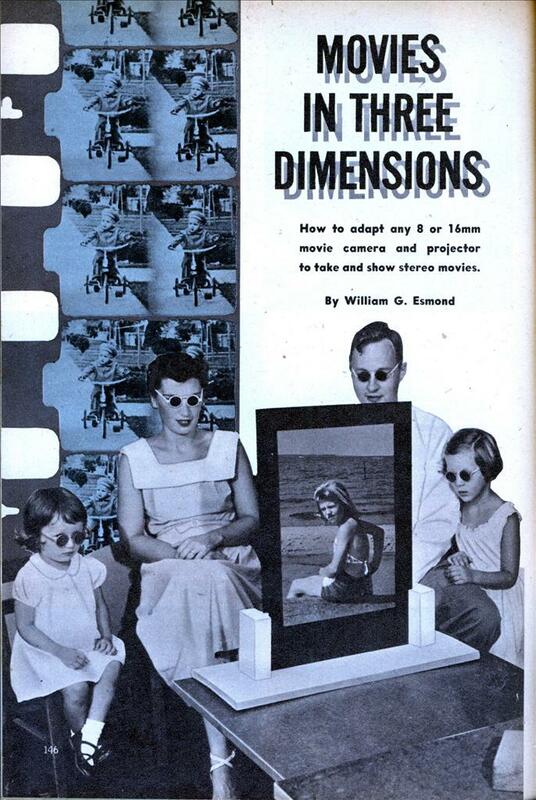 You could even use the RealD glasses assuming you used matching angles for the polarizers. Apparently home 3D will use shutter glasses. Samsung has DLP and Plasma TVs that are 3D ready. It would be cool if they made a in-house size rather than house-sized LEDTV like at Yankee Stadium.